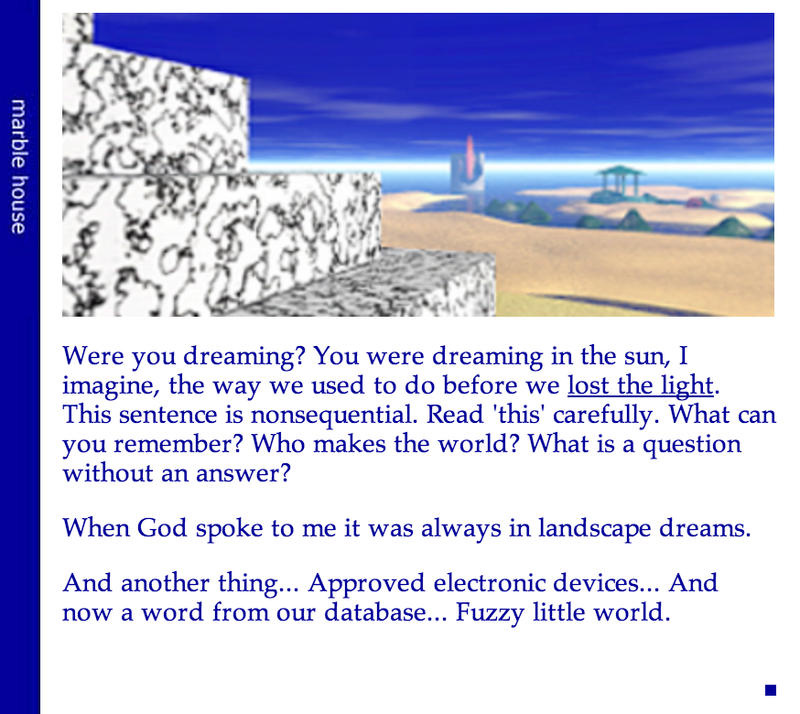 Our project remixes Stuart Moulthrop’s 1999 hypertext novel Reagan Library. 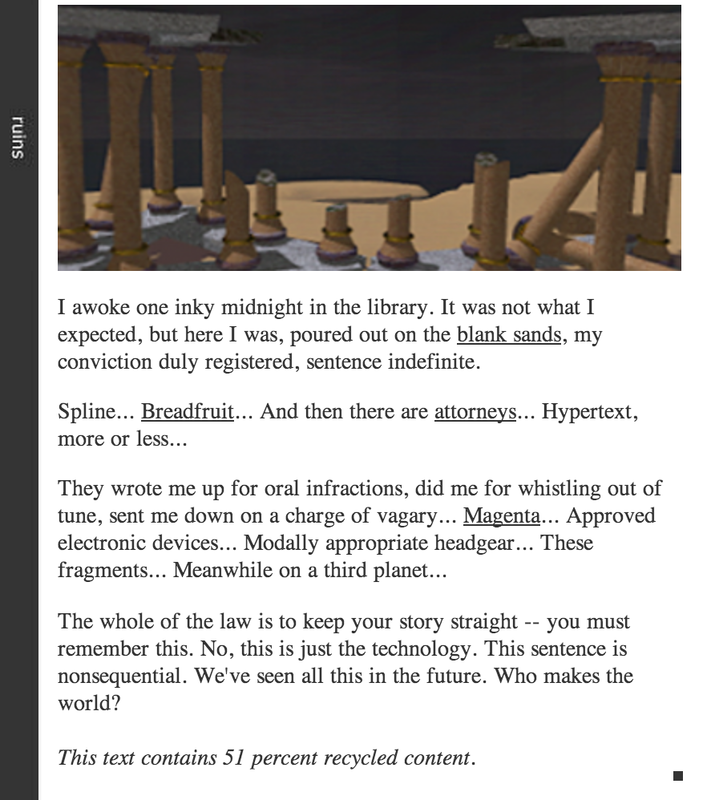 Moulthrop’s work suggests that hypertext fiction is a “crime against the humanities,” a sardonic reference to the academy’s trivialization of electronic literature. We argue that Moulthrop’s work invites its readers to engage with his text at the level of code, and our project takes up this challenge through the performance of a remix. It is a scholarly intervention in the field of software studies, demonstrating one way in which new interpretive frameworks can be applied to produce meaning from electronic texts. We argue that remix is a key method for engaging electronic literature because it allows us to access the expressive capacity of computational processes. Our remix of Reagan Library allowed us to understand the underlying structure of Moulthrop’s work while simultaneously providing a new framework to revisit a canonical text, Coleridge’s Rime of the Ancient Mariner, and engage with it in a new way. We used the remix as an occasion for exploration and invention and as a new way to approach scholarship in the humanities. Engaging with Reagan Library’s code allowed us not only to better understand its narratives but also to uncover a more complex, nuanced argument about the nature of memory, both human and nonhuman. Our essay guides readers through the process by which we gained access to the digital underbelly of Reagan Library, explores our findings, and showcases the website and remix that grew out of this work. Ultimately, our project attempts to provide scholars with another possible intervention for writing and thinking about electronic literature. Video: Remixing Reagan Library: Engaging with Code in the Humanities. In fact, Reagan Library was borne by virtue of what Matthew Kirschenbaum would call its “formal materiality.” That is, without QuickTime VR, there would be no Reagan Library as, Mouthrop explains, the story grew out of his experimentation with rendering images for QuickTime VR. Importantly, however, Apple discontinued the QuickTime VR plug-in in 2008 and Moulthrop was forced to remake the panoramas using Flash. This change in “formal materiality” is a rich source of analysis in thinking through the very nature of digital texts — that is, while in some sense the digital world provides for more reliable storage because copies can proliferate throughout the internet landscape, unlike print media, the usability of digital texts is reliant on third party software which may change or cease to exist at any moment. Digital texts, then, unlike their print counterparts, require vigilant caretakers whose work is the preservation of an increasingly anachronistic text that must continue to conform to the ever changing digital landscape. In the years before Reagan Library was published, the digital landscape had undergone significant change with the introduction of the GUI in the late 1980s and high-resolution computers in the 1990s, and the time was ripe for commercially available products that made use of these features. Though Apple released its first version of QuickTime in 1991, it was suited only for live-action and cartoon-like videos. QuickTime Virtual Reality (VR) was not made commercially available until the release of QuickTime 2.5 in 1995. Once Moulthrop had composed the actual image in Bryce 3d Package (released in 1996), creating a panorama with QuickTime VR still required the $2,000 QuickTime VR Authoring Tools Suite, which included three intimidating binders, a video tutorial, and a set of floppy disks. With no formal training, Moulthrop quickly made sense of rendering other-worldly panoramic images inspired by the computer video game Myst and importing them into QuickTime VR to develop user-interactive panoramas replete with “hot spots” or hyperlinks in specific image locations. Reagan Library is made up of four “worlds”: blue, green, black, and red. Each of the four worlds has a separate narrative and employs its own distinct visual rhetoric. Structurally, all four worlds are the same: each page is made up of four frames (only three of which are visible). 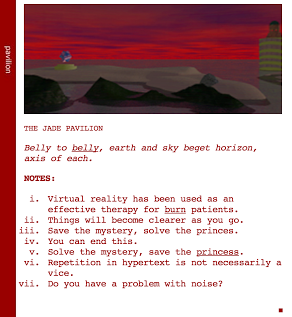 The first frame lines the left side of the page with a block of color and a title denoting locations such as “pavilion” and the “obelisk.” Next to this frame are two larger frames, the first of which holds a panorama powered by QuickTime VR which allows the reader to see some of what the character sees (see figure 1). Figure 1: Panoramic view of the blue world designed with QuickTime VR. Each world is made up of 28 htm pages; these pages are further divided into 7 “chapters”; each chapter is made up of 4 “levels.” Upon clicking the ominous “begin” button on the Reagan Library start page, readers will end up on one of four pages: the chapter 1 - level 1 of any of the four worlds (rl00.htm, rl70.htm, rl210.htm, rl140.htm)(see image map of the begin button in figure 2). Readers then progress through the text by choosing one of the several hyperlinks located in the body text which takes them to another page (more on this later). Figure 2: Image map of the “begin” button. Figure 3: Moulthrop’s code for tracking the reader's unique path. Figure 4: Reagan Library’s invisible fourth frame, which logs the reader’s path. Each page is made up of some static text and some pseudorandom text (or rather, pseudorandom sentences). 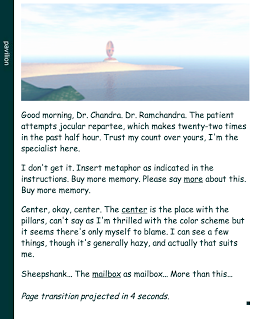 Each level contains less and less pseudorandom text and more and more static text. As a result, the more time a reader spends with Reagan Library, the more the text begins to make sense. The random text is also the explanation for one of Reagan Library’s most charming features: that no page is ever the same. Disorienting as it may be at first, each time the page is reloaded the program calls for new random text. It’s still the same page and the static text is still the same. The pseudorandom text is fed into pages using the functions “numeric,” “advice,” “sententious,” “fragmentary,” and “nominal.” Inside each of these functions is an array of sentences and sentence fragments. Each time the page loads, one of these sentences will be randomly chosen to inhabit a space on the page. For example, the sententious function (see figure 5) has an array of 104 sentences (which are sententious in theme) that may be placed on a page (pictured in pink). Likewise, the “nominal” array is made up of names, the “advice” array is made up of advice, and the “fragmentary” array is made up of sentence fragments. As a result, while the text is in some ways random (we don’t know which sentence/sentence fragment we will see), the kind of sentence we see has been carefully chosen (advice, fragments, names, and so on). Figure 5: Moulthrop’s code for the “sententious,” function that generates pseudorandom text. Figure 6: Here we have rewritten the text to illustrate how Reagan Library’s screen level output relates to its code. If we look at the same page at the level of code, our understanding of the page deepens (see figure 7). Here we can see more clearly the line of static text and the following call for five “fragmentary” sections, then more static text, then a call for “superNoise” which calls up random sections from fragmentary and sententious, then more static text, and then a call for five sententious sentences. Figure 7: The actual code that generated the page in Figure 6. Figure 8: Reagan Library’s hyperlink system: this code creates a sense of randomness while maintaining narrative coherence. For example, we can see in figure 6 that, of the three links on this page, only one is in static text. In other words, while “sententious46” and “sententious26” will use the rTransit function (taking us to a random place in the text), the “throbbing pink interior” uses the hTransit link (taking the reader to a place in the text based on where they have already been using the “keepTrack” function described above). As a result, if readers pay careful attention to the links they choose and if they choose links inside the more narrative-driven static text, they will progress through the story more quickly. It is important to note that what Moulthrop does with hyperlinks here was unprecedented. In 1999, hyperlinks were understood only as vehicles of transit to a specific, pre-defined location (Moulthrop, personal). Moulthrop bucked this tradition, which — for a 1999 audience especially — further disorients to reader who understands transit through a web page only as a predefined path. Moulthrop began the composition of Reagan Library by designing the QuickTime VR panoramas, each of which took many hours to render. Moulthrop recalls taking his laptop to bed and waking up in the middle of the night to check on the rendering process (Moulthrop, personal). The panoramas, then, are not only integral to the narrative, but the narrative's progenitor. Moulthrop's goal was to create a world that was new, unlike anything we have seen before (Moulthrop, personal). In many ways, he has certainly accomplished this goal. The blue world (see figure 9) — a world with Trebuchet and Palatino fonts and which the panoramas tell us is full of deep blue hues, ocean, beach, and sky — contains a story told by Emily Saint Cloud. Emily, grieving for her dead father, tells us of her youth, her experience with psychotherapy, and her visions, and her film career. The story moves without attention to time. Rather, like a shared memory or stream of consciousness, Emily tells us about how she sees the world. Figure 9: The blue world, narrated by Emily St. Cloud. The black world (see figure 10), as one might expect, is dark, with traditional Times New Roman font and the panorama’s black sky and aging images. 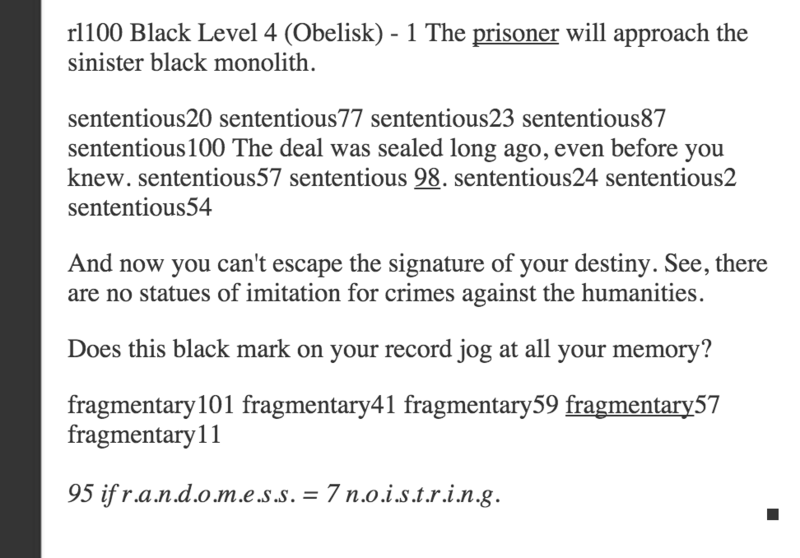 We are told that “the prisoner will approach the sinister black monolith” (chapter 1 level 4). The “prisoner," is sure that he's done something wrong and “lit out” for the islands. He cannot, though, remember how he got where he is or why he is being punished and he must wait in a purgatorial state until he does. This character again sees a black cone (just as Emily does), and while this cone comforts him, it is dark and ominous looking (while Emily’s was filled with stars). Furthermore, both are seen in dreams. The prisoner seems to be traveling in a world of dreams from which he never escapes. Figure 10: The ruins in the dark and dreamlike black world, narrated by a prisoner. Figure 11: The green world, narrated by a stand-up comedian. No one was sure what it was supposed to be, not even the art director, or what scenes it went with or even where it came from. One of the more bizarre stories said there was a tag on the back that read ‘property of Ronald Reagan library.’ I never looked. In fact, nobody in cast or crew would come within arm’s length of it. The bloody thing glowed in the dark, and worse than that, it hummed, giving off this constant NNNNNN on some frequency too low to hear, a buzzing you felt in your breastbone. We christened it The Artifact. I’m not surprised to find it here. Are you? The cone is a tantalizingly cryptic object that elicits curiosity and scrutiny, mirroring the reader’s experience as she navigates her way through the four worlds. The red world (see figure 12), rife with dark and ominous imagery, is the only world that speaks directly to the reader. 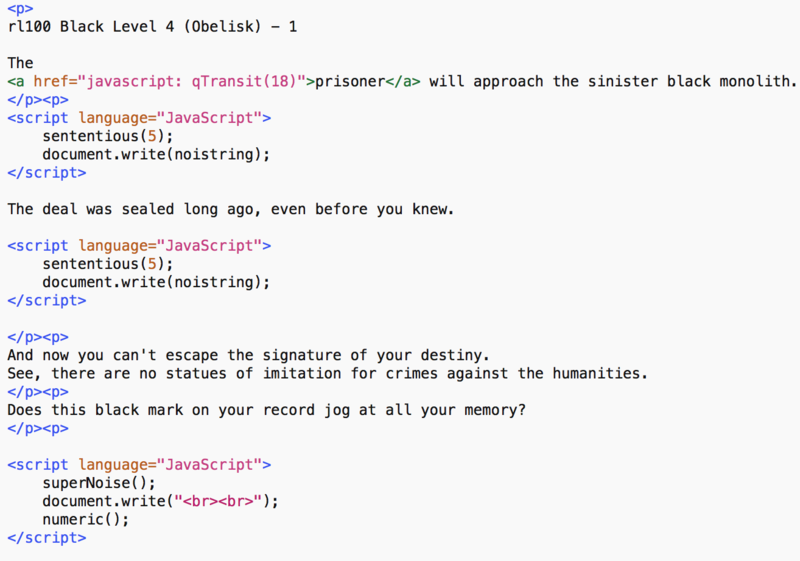 The text of the “advice” function only appears in the red world, suggesting to the reader that, among other things, they “can end this” and should “move the camera.” The red world’s use of direct address evokes the sense that it is your world — that you, like the characters in the other three worlds, are working to figure out where you are and how got there. Figure 12: The ominous red world, the world that addresses the reader directly, giving her cryptic clues for navigating the text. Taken together, we know that these stories are about memory, media, mental health, and death. These characters are traversing the same world, but are experiencing it differently. What's more, all three of the characters worked in the entertainment industry, were from California, and have recently been on a plane. Likewise, in the red world we are told that “some trees grow after they are dead,” and Emily explains that God always spoke to her in landscape dreams. Is it possible, then, that Reagan Library is the story of three dead people…and you? Richard Ness is a PhD candidate in the Literary Studies program at The University of Wisconsin-Madison. Richard’s primary focus is British Romantic literature, and his interests also include the history of science, rhetoric, digital rhetoric, and multimodal composition. His current research examines the relationship between lyric poetry and vitalist science from a rhetorical perspective. Margaret Bertucci Hamper is a PhD candidate in Composition and Rhetoric and the assistant director of the intermediate writing program at The University of Wisconsin-Madison. Her research focuses on the intersections of literacy, race, and class. Lauren Gottlieb-Miller is a Librarian at the Menil Collection in Houston, Texas. Her research focuses on the history of print and digital culture, preservation and access in art museum contexts, and contemporary art documentation. She can be reached at lgottliebmiller [at] menil.org.